Throughout the day preceding the funeral of President Howard W. Hunter, over 25,000 mourners filed through the Church Administration Building and past his bier to pay their respects. 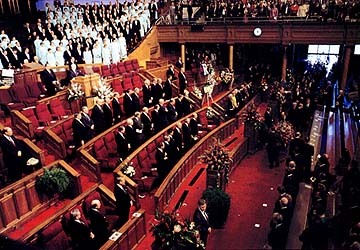 General Authorities, members of the Tabernacle Choir, and other mourners stand as President Hunter’s casket, covered with flowers, is brought into the Tabernacle on Temple Square. 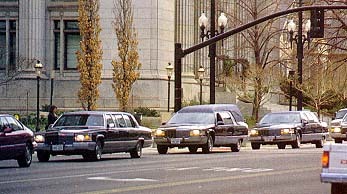 President Hunter’s funeral cortege moves past the Church Administration Building, headed down South Temple Street toward Temple Square. 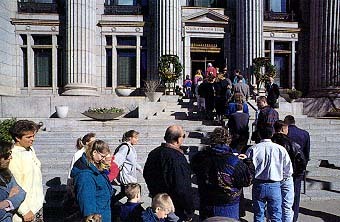 General Authorities and family members line the entrance to the Tabernacle as President Hunter’s casket is wheeled in. 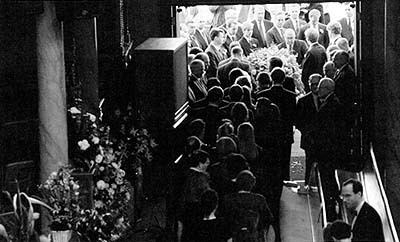 Pallbearers, family members, and General Authorities cluster in the entrance to the Tabernacle, surrounding the casket. 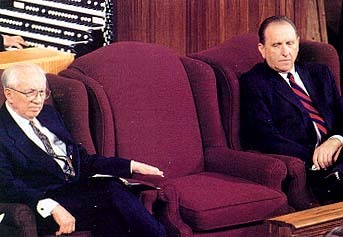 President Gordon B. Hinckley, left, and President Thomas S. Monson at the funeral service assumed their customary places. 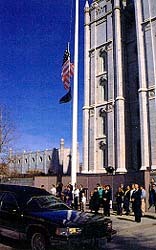 Flag at half-mast, mourners outside the Tabernacle reverently stand as the hearse bearing President Hunter’s casket pulls away. 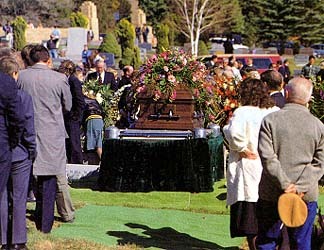 The weather was mild and sunny for the graveside service at the Salt Lake City Cemetery. The flowers on top of the casket and flanking it were only a few of the many floral tributes to President Hunter. 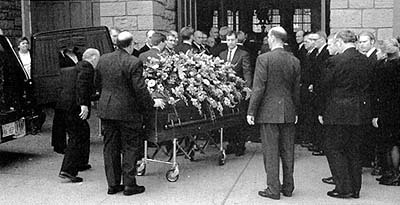 Mourners in the Tabernacle represented Church members worldwide. Family and friends shared their love and support with Sister Inis Hunter.